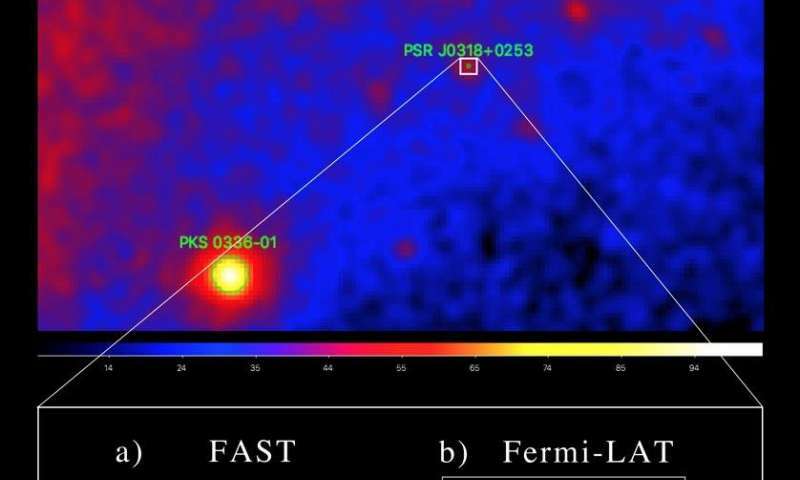 China's 500-meter Aperture Spherical radio Telescope (FAST) discovered a radio millisecond pulsar (MSP) coincident with the unassociated gamma-ray source 3FGL J0318.1+0252 in the Fermi Large Area Telescope (LAT) point-source list. This is another milestone of FAST. FAST, world's largest single-dish radio telescope, operated by the National Astronomical Observatory of the Chinese Academy of Sciences, has discovered more than 20 new pulsars so far. This first MSP discovery was made by FAST on Feb. 27 and later confirmed by the Fermi-LAT team in reprocessing of Fermi data on April 18th. The newly discovered pulsar, now named PSR J0318+0253, was isolated via the timing of gamma-ray pulsations. This discovery is the first result from the FAST-Fermi LAT collaboration outlined in a MoU signed between the FAST team and Fermi-LAT team. "This discovery demonstrates the great potential of FAST in pulsar searching, highlighting the vitality of the large aperture radio telescope in the new era," said Kejia Lee, scientist at the Kavli Institute of Astronomy and Astrophysics, Peking University. Radio follow-up of Fermi-LAT unassociated sources is an effective technique for finding new pulsars. Previous radio observations, including three epochs with Arecibo in June 2013, failed to detect the MSP. In a one-hour tracking observation with the FAST ultra-wide band receiver, the radio pulses toward 3FGL J0318.1+0252 were detected with a spin period of 5.19 milliseconds, an estimated distance of about 4000 light-years, potentially one of the faintest radio MSPs discovered. The planned Commensal Radio Astronomy FAST Survey is expected to discover many millisecond pulsars and thus will make significant contribution to the PTA experiment. "The international radio-astronomy community is excited about the amazing FAST telescope, already showing its power in these discoveries. FAST will soon discover a large number of millisecond pulsars and I am looking forward to seeing FAST's contribution to gravitational wave detection," said George Hobbs, scientist of the Commonwealth Scientific and Industrial Research Organization (CSIRO) of Australia and member of the Gravitational Wave International Committee (GWIC).